Jonny Lomax (centre) celebrates after scoring his side's eighth try of the game during the Betfred Super League win over Castleford. St Helens showed their Betfred Super League title credentials by maintaining their perfect start to the season with an outstanding 42-12 victory over Castleford. 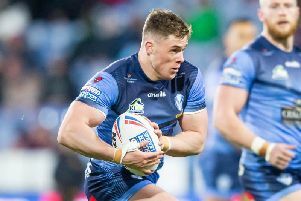 Justin Holbrook's men were in scintillating form as they ran in eight tries to make it seven wins from seven this season in a one-sided contest at the Mend-A-Hose Jungle. Lachlan Coote powered over inside five minutes to set Saints on their way before Regan Grace's acrobatic finish and Dominique Peyroux's second try in two matches put the visitors 18-0 up at the break. Zeb Taia, Louie McCarthy-Scarsbrook and Mark Percival extended Saints' lead to 32-0 before Castleford captain Michael Shenton grabbed a consolation score with an interception try, although he looked to be well offside, against his former team. Peyroux crossed the whitewash for his second and Jonny Lomax also dotted down before Jake Trueman added a Tigers score as St Helens sent out a daunting message for the rest of Super League. It did not take long for the visitors to put their stamp on the match when they worked downfield after winning a penalty with Coote crashing over for the first try. Castleford had a great chance to hit back instantly when Saints let Trueman's kick-off bounce out of play for a goal-line drop-out but the home side could not muster an opening, which proved to be a feature throughout the match. The visitors nudged 8-0 ahead when Coote added a simply penalty for a high tackle after 15 minutes and Saints continued to pile on the pressure as they penned their hosts inside their own half. And their dominance eventually told once more as a knock-on by Greg Eden gave the visitors the ball on Castleford's 10-metre line and they worked their way from right-to-left for Grace to dive acrobatically over in the corner. The hosts gifted Saints another chance to gain territorial advantage when Eden picked up a loose ball, only to throw a loose pass for visiting forward Matty Lees to claim. Lees was halted but the Tigers could not deny Peyroux, who cut through the home defence for Saints' third try of a one-way first half, which saw Castleford head coach Daryl Powell storm across the pitch in frustration as the visitors took an 18-0 interval lead. Castleford's luck did not change as St Helens crossed for the fourth time just three minutes after the restart. Eden was hauled into touch by Tommy Makinson after a fine high kick from Coote to regain the ball and they worked their way for Taia to stroll through to extend their lead to 24-0. Joseph Paulo thought he joined the try-scorers but he was denied by the video referee, only for Theo Fages to tee up McCarthy-Scarsbrook to power his way over in the 51st minute for Saints' fifth score. Mark Percival stretched over for the visitors' sixth try two minutes later to put St Helens out of sight before Michael Shenton ensured Castleford got on the scoreboard with an interception try with 21 minutes remaining. Peyroux squeezed over despite the attention of three defenders for his second try of match and Lomax wrapped up the scoring late on to cap off a sensational team performance.